A young camel disappears from its trainer’s paddock and the coat of a murdered woman is found abandoned in the sand dunes. These seemingly unrelated events are a far cry from the regular police duties of Constable Chris Blackie and his rookie recruit from Melbourne, Anthea Merritt, in the small seaside town of Queenscliff. Little by little and with a burgeoning sense of menace, these two unlikely detectives carefully navigate the eclectic, often eccentric personalities of the town, as well as the disdain of law enforcement colleagues further afield, to uncover the unsettling truth. “In the pale green light, a woman was leading a young camel round a paddock. Camilla Renfrew stopped on the seaward side of the fence to watch.” Soon the camel will be missing and Julie Beshervase will accuse Camilla of stealing Riza. Anthea Merritt has been appointed to the Queenscliff police station and is disappointed both with Queenscliff and her boss, Chris Blackie a long term local Constable, who likes to tend the garden around the police station as his daily exercise. Finding a missing camel in Queenscliff, a Victorian coastal town is not an easy task. At first it is a humorous and somewhat frustrating event, firstly all the locals claim to be inside on the night of the disappearance and secondly everyone thinks that because a camel is not easy to hide the crime should not take long to solve. The story provides an interesting avenue in which to explore the nature of small towns – the relationships between parents and children, those who have money and those not so well off, the independence of the elderly and what it is like for new comers, particularly Anthea who is also pining her boyfriend who is in the city. Finding the missing camel leads to evidence of another crime. This adds complexity and mystery to the story and provides an opportunity for Chris Blackie to display his policing talents to his new assistant. For many Victorians Queenscliff is a summer holiday destination and the town is wonderfully amplified in the story. I am sure many readers will remember the hustle and bustle of Hesse Street on New Year days and feel for Anthea as she attempts to see if anyone can remember a Land Cruiser. In addition quirky characters such as Brian Laidlaw who scavenges among the tide line and looks for what “each flood tide happened to deposit at his feet” give a small town feel. As Anthea comes to terms with living in Queenscliff she takes many walks along the cliffs. The characters and description of the town provide a wonderful sense of place which amplifies Queenscliff in all its glory. 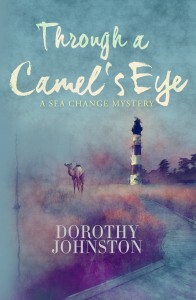 Through a Camel’s Eye is the first of Dorothy Johnston’s sea change mysteries. As a frequent visitor to Queenscliff I look forward to the next.